The New England town’s connection to the land goes way beyond skiing. Home to the state’s highest peak of Mount Mansfield, Stowe, Vermont is best known for its skiing. It is so much a ski destination, in fact, that the tiny town is referred to as both the Ski Capital of the East and the Swiss Alps of the East. When snow is on the ground, you can fill your days with endless outdoor activity: not just alpine skiing, but traversing cross-country trails, skating at an outdoor ice rink, ice fishing on frozen ponds, dog sledding or “fat biking”—which, despite what SoulCycle might have you believe, is mountain biking on bikes with wider tires made for snow and ice. 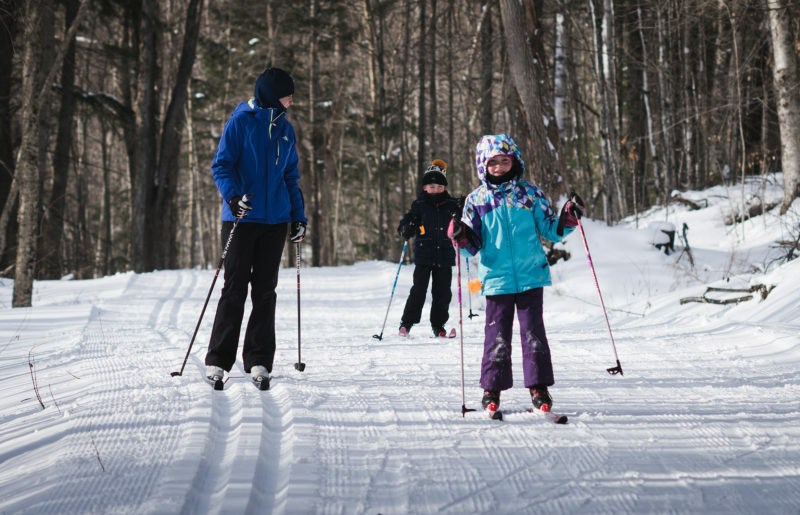 It’s easy to have a healthy, exercise-heavy vacation in Stowe, especially in January, when resolutions are new and, in the quiet after the holidays, your time is finally your own again. Stowe, though, is so much more than a ski town. It’s a quintessentially New England village, where farmers and food producers are as connected to the land now as their predecessors were when the town was founded as part of the New Hampshire colony in the 1760s. It’s also the place where the von Trapp family—yes, the The Sound of Music von Trapps—landed after fleeing Austria in 1938. 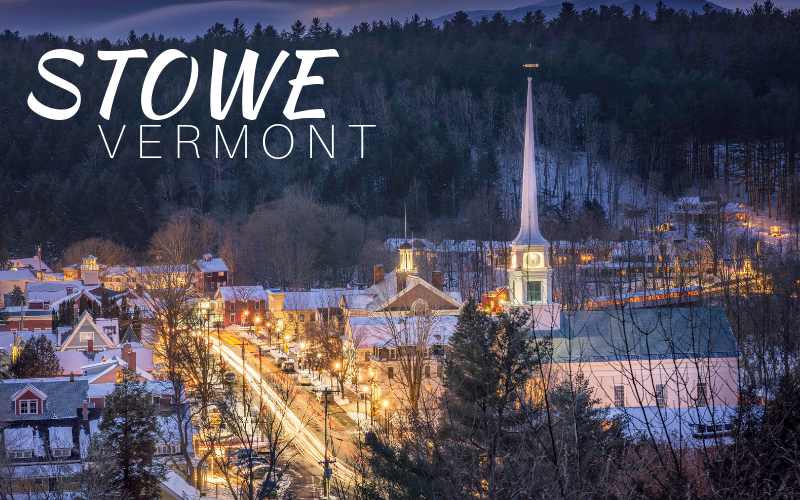 Maybe because of its colonial history, and maybe because of Stowe’s place in World War II lore, the town also has a European feel to it, both in terms of how it looks and in the quality of its artisan producers. I visited Stowe in early autumn, expecting a weekend of beautiful scenery and not much more. What I found was a tiny town full of some of the best craft foods I’ve ever eaten. 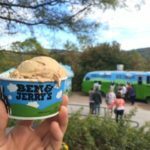 Of course, there are some big names, like Ben and Jerry’s ice cream factory that offers tours and has a “flavor graveyard” for retired favorites like Rainforest Crunch. There’s also Cabot Cheese, which is made in Vermont and available in nearly every grocery store’s refrigerated section nationwide. 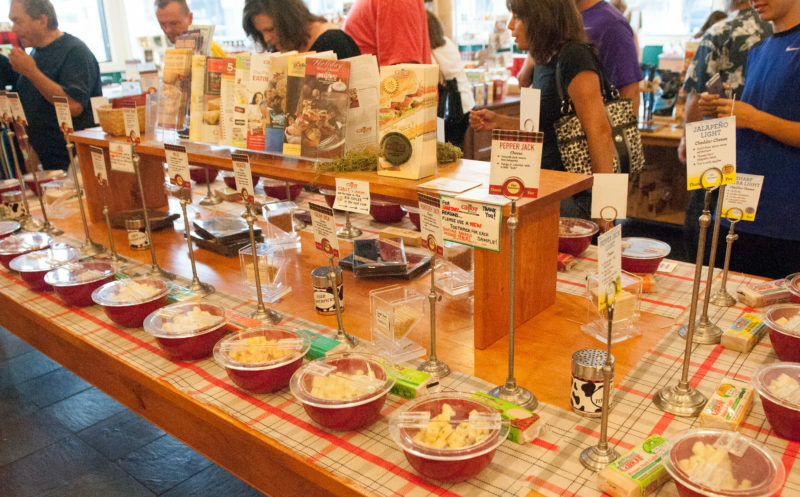 Stowe’s Cabot Farmer’s Store has an enormous tasting table with dozens of cheeses way beyond cheddar. Next door, Smuggler’s Notch Distillery, named after a local bootlegger’s run, makes organic vodka and some really interesting whiskeys, including maple bourbon. Those big names, though, don’t hang over the town the way they do in some other places (like a certain town in Pennsylvania named after its biggest export, the Hershey bar). 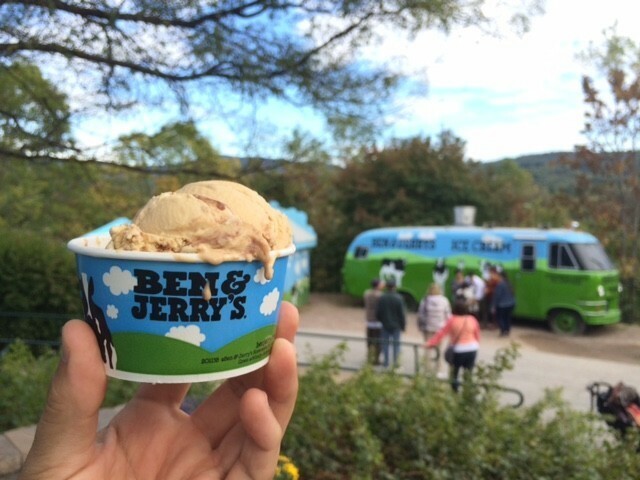 I never heard locals buzzing about ice cream moguls. A waitress, learning that I had arrived only hours earlier, told me that the must-taste in town is beer from The Alchemist, which, she promised, is hard to find outside the area but among the best beer she’d ever sipped. The brewery’s best-known beer, Heady Topper, is an IPA only distributed the week it’s made, within just a 25-mile radius to preserve the freshness and trademark hoppiness. It’s locavore consumption not for the sake of a buzzword, but because the brewers genuinely believe that staying small and local delivers the best possible product. 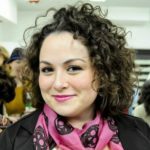 That philosophy makes sense, considering that Vermont is arguably the most locavore state: according to the Vermont Agency of Agriculture and the Stowe Farmers’ Market, Vermont leads the country in per capita CSAs, farmers markets, organic producers and dollars spent on local foods. 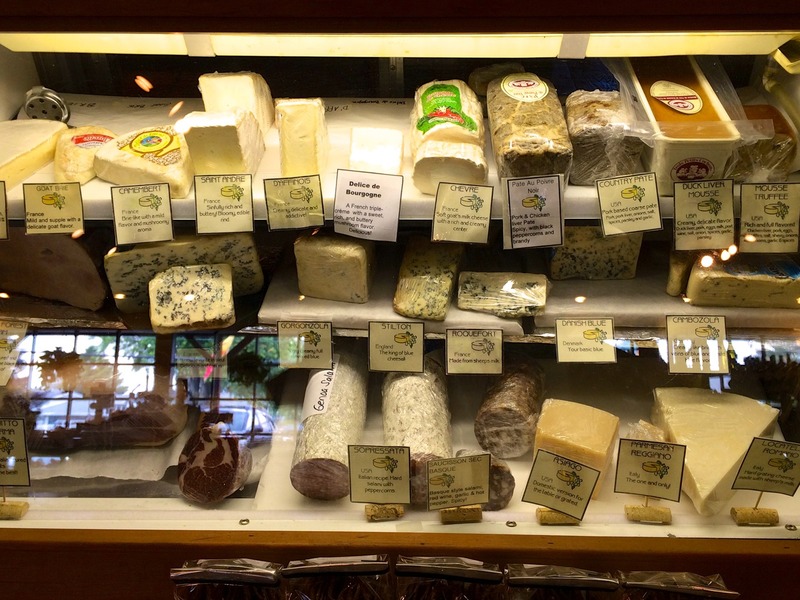 At that market, every cheese tasted better than the last, from the fresh chevre made down the street at Sage Farm Goat Dairy to the cheese curds from Sweet Rowen Farmstead, produced just south of the Canadian border in the state’s Northeast Kingdom. (It was also the last time I ever took a road trip without a cooler, because it was very hard to leave the state without cheeses to take home.) At Stowe Mercantile, a country store that sells all Vermont products, there are hundreds of foods, beers, wines and hard ciders, all made locally. Hard cider is especially popular in Stowe: Stowe Cider makes eight rotating brews according to the seasons, and there are 16 other producers in the small state. Back to the von Trapp family. Maria and her children opened a rustic inn in 1950, which has grown into the Trapp Family Lodge. The 90-room, alpine-inspired resort has three farm-to-table restaurants, including a bierhall that serves Austrian foods like chicken schnitzel, “drunken” beer-marinated steaks and cured Austrian sausages, all available alongside Viennese and German-style von Trapp Brewing beers. That European influence isn’t just in the edelweiss-infused air at the lodge, though. It’s everywhere in Stowe, like at the raclette-serving Swiss Fondue by Heinz, a restaurant both derided and beloved for its throwback feeling to when fondue was the height of fashion for dinner parties. It’s at Idletyme Brewing, a brewpub serving grilled bratwurst with beer mustard to accompany its German-style beers like Maerzen, a seasonal malted lager, and Dunkel Lager, a dark, Munich-style beer. It’s even in the spas: where I stayed, at Stoweflake Mountain Resort, there was a Hungarian Mineral Soaking Pool, which is a European-style hydrotherapy hot tub with mineral salts from Hungary. It shares an all-season aqua solarium with the Bingham Hydrotherapy Waterfall, where you sit underneath a powerful waterfall built to look like one of Stowe’s most beautiful natural features and get a full body massage while looking out onto the snow-covered Mount Mansfield. The experience is exactly as luxurious as it sounds. Stowe isn’t just one of those postcard-perfect New England towns; it sets itself apart, not only in character, but in taste. In Stowe, people harvest the land and create cuisine that can’t be replicated anywhere else.